Jeera or cumin seeds are one of the most commonly used spices in Indian households. Not only does it add flavour to the dishes and make it more delicious, it also has a range of health benefits because of its anti-inflammatory, anti-fungal and anti-bacterial properties. Additionally, it has nutrients like Vitamin C, Vitamin A and iron which strengthen the immune system of the body. Cold – Boil 1 tablespoon of Jeera seeds in 2 cups of water over simmering flame. Then add a 1 inch long piece of crushed ginger to the boiling water. After 2 minutes remove and strain the preparation so that the jeera seeds are left out. Consume 1 teaspoon of this water based preparation as often as you can for relief. This simple-to-prepare solution will not only help relieve cold, but also help in digestion, boost metabolism and help flush out toxins from the body. Headache – Heat up about 1/2 litre of sesame oil on stove over slow fire. Then add 25 grams of cumin seeds in it. Once the cumin seeds start to break, remove the preparation from stove, let it cool down and strain the oil. The oil thus prepared can be stored in a bottle and can be applied on the scalp whenever there is a headache. Piles – Prepare 1 glass of butter milk and add 1 teaspoon of Cumin Seed powder and about 1/2 teaspoon of ginger juice. This can be consumed frequently for quicker relief. 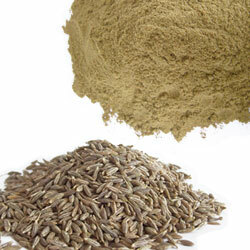 Cumin seeds cure the infections and wounds present in the digestive system. It speeds up the digestion process and reduces the chances of developing piles. Bloating and Constipation – Cumin Tea can be prepared by boiling 1 glass of water and adding 1 tea spoon of cumin seeds to it. The decoction should be cooled and filtered before consuming. You may add honey to it. This is good for people suffering from digestive disorders. Cumin tea relaxes the intestines and gives relief from constipation and bloating. Bleeding of gums – Take equal portions of cumin seed powder and rock salt and apply it over the infected area. This prevents bleeding of gums and also strengthens them. Nausea in Pregnant women – Prepare juice from 1 lemon and add 1 tablespoon of water in it. Mix 1/2 teaspoon of cumin seed powder in the diluted lemon juice and stir it until the spice mixes evenly with the juice. Consume it whenever the symptom occurs. Sleeping Disorder – Take 1/2 teaspoon of the powder of roasted cumin seeds and mix this with the pulp of a ripe banana. This can be taken at night to induce sleep.